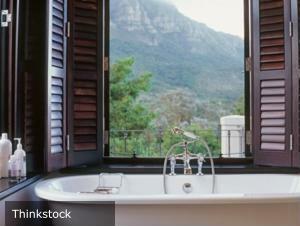 There's nothing better than enjoying a hot bath on a lazy Saturday and looking out the window to enjoy the natural scenery. If you have a washroom that has large windows and an abundance of natural light, placing a bathtub near this area is one of the most popular interior design styles around. While there are many choices of bath tubs to consider, the timeless look of a cast iron tub seems to never go out of style. These opulent pieces will become an instant focal point in your bathroom, and you can infuse your space with a touch of metallic color by choosing silver or gold faucets and clawfoot bases. A cast iron tub is a fabulous choice for those looking to craft a traditional or rustic interior design, and it can blend beautifully with a wooden bathroom vanity or an antique variety. These items can also combine nicely with copper bathroom accessories and other small items to pull the look of the space together. When you're shopping for a bath tub for your washroom, going with a classic design could bring a lasting quality to your space for years to come.